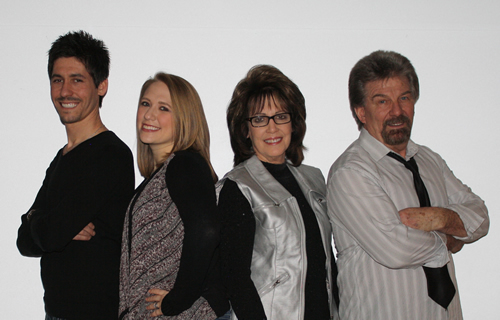 CrossOver is a southern gospel family singing group located in central Pennsylvania in the small town of Mahaffey. CrossOver began it's music ministry in 2004 at the Pennsylvania State Singing Convention in Martinsburg, Pa. The group is made up of mom and dad, Beau & Jeanne Litz, and their son and his wife, Shane & Cortney Litz. The members of CrossOver believe that God's word clearly says, "Go ye into all the world and preach my word", and this means they too must go anywhere and sing and witness to others about the saving grace and knowledge of Jesus Christ, our Lord and Savior. Their goal is to bring the joy of the Lord, through music, to each and every one they meet. They are very thankful as a family to be able to do this task and have enjoyed every moment and each new friend they have met along the way. CrossOver has had the pleasure of singing at gospel sings, church services and private dinners, and even Cruiseline tour ships. They have opened for The Hoppers, The Whisnants, The Nelons, The LeFevres and Ivan Parker. CrossOver's members give special thanks to each organization that has allowed them to be a part of an event. It is their hope that GOD will richly bless each one and to HIM be all the glory.